A compact Latin percussion section. John Dolmayan, whose drumming and percussive punch has defined System of a Down's sound, has collaborated with LP, resulting in the introduction of the John Dolmayan Timbale Drum Pack. John Dolmayan has long used a collection of LP percussion instruments on stage and in the studio to great effect. The mini timbales were designed to be the perfect addition to your drum set, in response to current trends in augmenting drum kits and percussion. 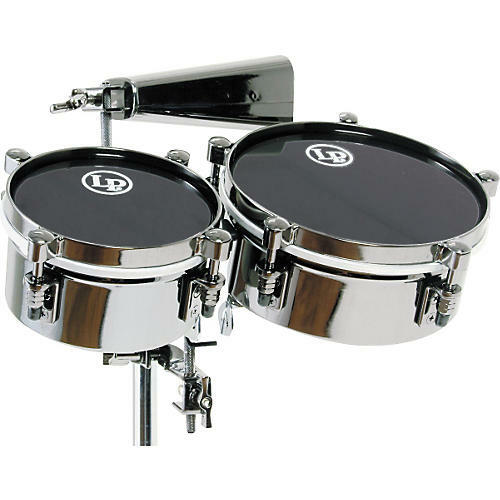 The Dolmayan Pack consists of a pair of LP845-K Mini Timbales and a bonus Cha-Cha bell. The timbale drums have a special provenance. They're fashioned after LP's heritage full-sized Tito Puente Timbales but simply reduced in size to 6" and 8" diameters. The black nickel-plated steel shells are fitted with traditional Cuban-style tuners. Both drums produce bright percussive effects, as well as traditional center-of-head, rimshot and shell timbres. Their inherent dryness enables them to blend with a variety of percussion and drums. In addition they're armed with a reserve of bright harmonics for penetration (remembering that Mr. Dolmayan's drumming cuts though SOAD's sonic blast!). To add that upper register effectiveness, the included Cha-Cha Cowbell emits a high-pitched chime with moderate overtones. The Dolmayan Mini Timbale Drums include a heavy duty black powder-coated mount-all bracket (LP236C) with a 3/8" diameter z rod, which will securely seat both timbales and cowbell, seamlessly integrating them with a drumset and locking them in place. LP is pleased to announce yet another top artist collaboration that has resulted in a system useable by all drummers in all styles. The John Dolmayan Timbale Pack is the perfect expansion for any drum set. Order today.